This colorful free standing Mugen 2018 calendar with delight you with a new photo of Mugen Motosports activity every month! A must have for every Mugen enthusiasts! The MUGEN 16 Mug is a colorful earthenware mug for your favorite 11.5 ounces of hot or cold beverage. #TeamMugen16 FTW! With the case of the ordinary visors, when the side window is open even slightly, air emitted from the front opening flows upward along the window and re-enters the passenger compartment. Will not fit US Production car. Mugen 16 double zipper hoodie is made of 80% cotton and 20% polyester. Mugen 4-Piece Body Kit for 2010+ Insight - SAVE 40%! Regularly priced at $1,573 - you save $623! This is the biggest discount we have ever offered on a Mugen product! This 4-piece aero kit includes the Front Under Spoiler, Side Spoilers and Rear Under Spoiler. These parts are primed and ready for paint. The Mugen Hybrid Intelligent Sports Aerodynamic Enhancements were designed from the start to achieve a lower drag coefficient and eliminate lift. These pieces were developed utilizing substantial wind tunnel testing. As with all Mugen aerodynamic pieces, form followed function - the Insight's style and appearance are vastly improved in typical sublime Mugen style. These pieces deliver with quality, results and appearance. All pieces fit the U.S. market Insight and are made of top-quality materials, ensuring a perfect fit. The perfect finishing touch to your CR-Z's interior. In stock form, Honda's new CR-Z is both under-dampened and softly sprung. This combination really masks the sporting characteristics of the CR-Z. Ride along as we take a CR-Z equipped with the Mugen CR-Z Exhaust System out on the open roads outside our shop! 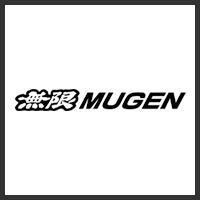 Mugen once again designs an exhaust system that offers great sound under acceleration, yet no drone at speed. As with all of Mugen's exhausts, the fitment, material and construction quality are superb. A black leather frame/holder with heavy red stitching holds a brushedmetal plate with polished and debossed Mugen logo in place. Upgrade your cell phone with the Mugen Phone Strap.